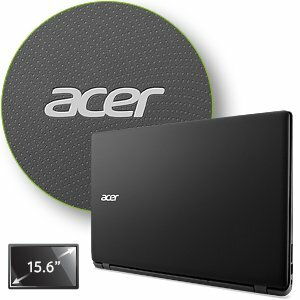 Acer Aspire ES1-511-C59V comes with these high level specs: Intel Celeron N2830 Dual-Core Processor 2.16GHz with Intel Burst Technology up to 2.41GHz, Windows 8.1, 15.6" HD Widescreen CineCrystal LED-backlit Display, Intel HD Graphics with 64MB of dedicated system memory, 4096MB DDR3L Memory, 500GB SATA Hard Drive (5400RPM), Secure Digital (SD) card reader, 802.11b/g/n Wireless LAN, Bluetooth 4.0, Gigabit Ethernet, Built-In Webcam, 2 - USB 2.0 Ports, 1 - USB 3.0 Port, 1 - HDMI Port, 3-cell Li-ion Battery (3220 mAh), Up to 4.5-hours Battery Life, 5.29 lbs. | 2.4 kg (system unit only) Get the power and useful features you value with the Aspire E 15 Series Notebook. 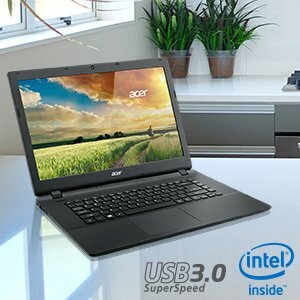 This practical yet stylish PC has solid performance, handy multimedia tools and convenient connectivity that make everyday activities like web browsing, communicating, and digital enjoyment an easy-going pleasure. Experience brilliant PC performance that lets you communicate with friends and family, enjoy entertainment, and get your work done. The Aspire E 15 Notebook provides the performance you’ve come to expect and quality you can count on with an Intel® Dual-Core Processor and 4GB of Memory. USB 3.0 port provides up to 10x faster transfer speeds than the standard USB 2.0! Transfer a 25GB HD movie in just 70 seconds. Plus, you can access your entire media library with up to 500GB of storage. With AcerCloud, your PCs storage IS your Cloud storage with wireless access to your photos, music, videos and documents -- wherever you are, on any PC, on all your devices! 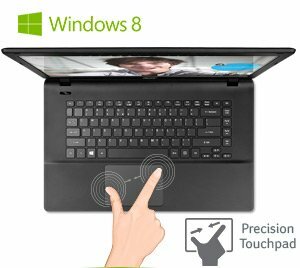 Acer's Precision Touchpad supports Windows 8 Modern Touchpad gestures and makes touch control as accurate and gestures as smooth as on a touchscreen. Pinch, flick and swirl your fingers on the Touchpad for an intuitive navigation of web pages, photos and more. Whether your friends and family are just across town or far across the country, your conversations will be up close and personal with the built-in Webcam and Digital Microphone. Enjoy clear video chats or snap still pictures to share. 802.11b/g/n Wireless LAN provides the freedom to road to hot spots while Bluetooth® technology lets your wirelessly connect to other Bluetooth-enabled devices such as printers and speakers, eliminating the need for a tangled wire. With Windows 8.1, you can get to everything you need from the familiar Start screen. Skype with friends, get work done with Office, access online files anywhere with SkyDrive, or find your favorite apps in the Windows Store. 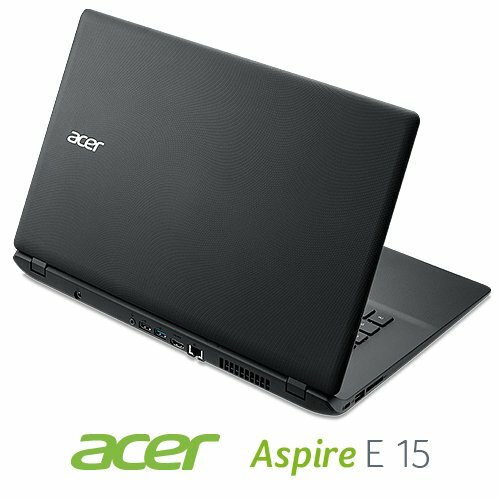 The Aspire E 15 Notebook is just over 5 lbs. and just over 1" thin, making it one of the slimmest notebooks in its category! Its elegant curvature and unique pattern adds stylish to the uncluttered, pure design, in which every detail has been carefully crafted. The large 15.6" HD CineCrystal™ LED-backlit LCD Display with a 16:9 widescreen aspect ratio delivers an optimal viewing experience. When the 15.6" fails to satiate your visual appetite, the HDMI™ output lets you pipe HD content and high quality audio to your big screen HDTV so you can share HD video with family members anywhere! Powerful speakers provide more realistic and lifelike sound, for great media experiences wherever you go. Listening to your favorite music or watching movies is now much more immersive.